To prepare a pure, dry sample of a soluble salt from an insoluble oxide or carbonate. Why was it necessary to warm the sulfuric acid? How did you know when the copper oxide was present in excess? 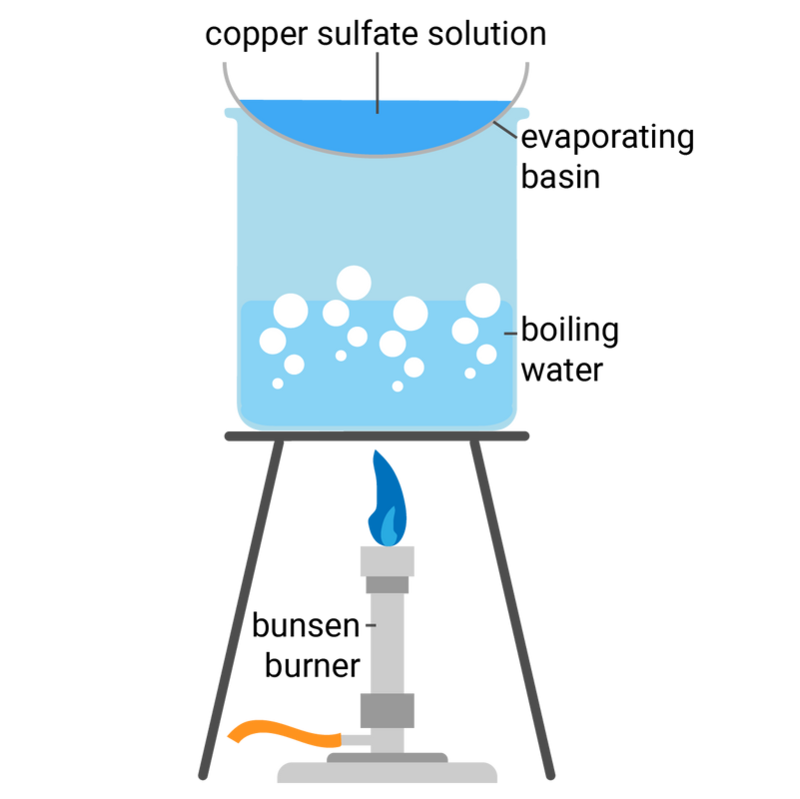 Why is a water bath used to evaporate the water from the copper sulfate solution instead of heating the evaporating basin directly with a Bunsen burner? Why should you not evaporate all of the water from the copper sulfate solution? This question is about making copper salts. Outline a safe plan the student could use to make pure, dry, crystals of the soluble salt copper sulfate from an insoluble metal oxide and dilute acid. Add the metal oxide to the dilute acid. Stir them. Filter the solution and then evaporate off the water. 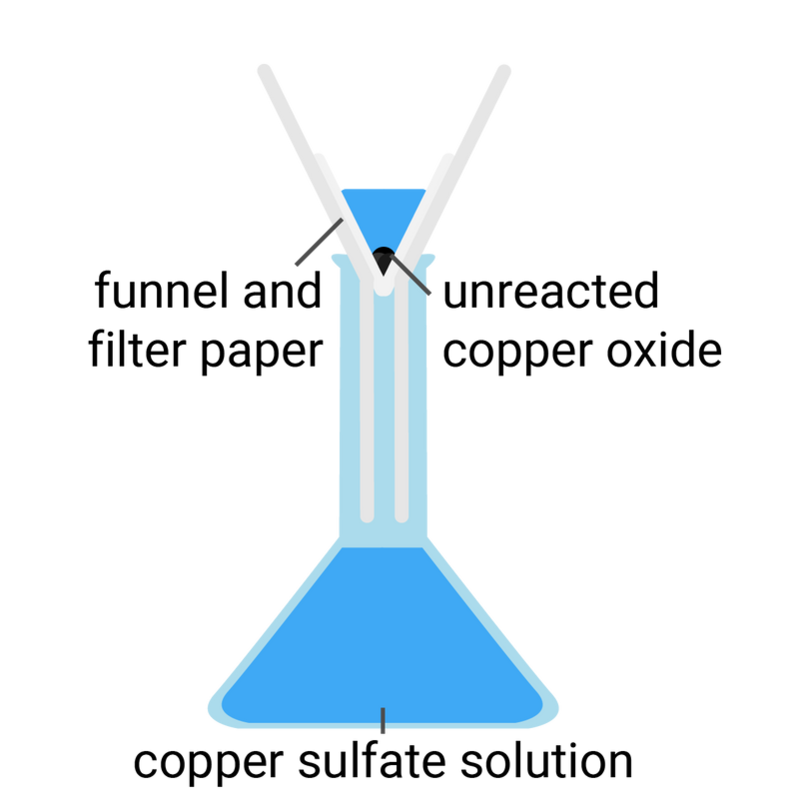 Safely measure 25 ml sulfuric acid into a conical flask. Add copper oxide to the flask, and then heat the acid until no more copper oxide will react. Pour the contents of the conical flask into an evaporating basin. Heat this gently and stop heating once crystals start to form. Leave the solution to evaporate overnight. Ensure you are wearing safety goggles and measure 25 ml sulfuric acid into a conical flask. Sulfuric acid is corrosive. Add excess copper oxide to the flask, and then heat the acid gently using the Bunsen burner, whilst stirring the solution, until no more copper oxide will react. Allow the solution to cool, then any remaining copper oxide must be removed using a funnel/filter paper, by filtration. Pour the contents of the conical flask into an evaporating basin. Heat this gently on a tripod and gauze, on top of a beaker half-filled with water. Stop heating once crystals start to form. Leave the solution to evaporate overnight, then remove the crystals and dry them.